New research forthcoming in the Journal of Population Economics finds: Having family members abroad internationally may be associated with greater well-being of those staying behind as one study shows Nikolova, Graham and Ivlevs)! However, it does not hold for the emotional health of elderly parents left-behind in China as other research in the Journal shows (Scheffel and Zhang). The authors are: Artjoms Ivlevs ( University of the West of England), Milena Nikolova (University of Groningen) & Carol Graham (The Brookings Institution). Milena Nikolova & Carol Graham are also Fellows of the Global Labor Organization (GLO). The paper is open access/freely downloadable and already pre-published online. 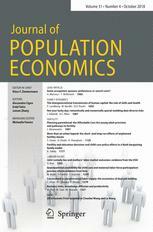 It is forthcoming 2019 in the Journal of Population Economics. A Brookings blog has just introduced and detailed the analysis and contribution of the paper: International migration: What happens to those left behind? We offer the first global perspective on the well-being consequences of emigration for those staying behind using several subjective well-being measures (evaluations of best possible life, positive affect, stress, and depression). Using the Gallup World Poll data for 114 countries during 2009–2011, we find that having family members abroad is associated with greater evaluative well-being and positive affect, and receiving remittances is linked with further increases in evaluative well-being, especially in poorer contexts—both across and within countries. We also document that having household members abroad is linked with increased stress and depression, which are not offset by remittances. The out-migration of family members appears less traumatic in countries where migration is more common, indicating that people in such contexts might be able to cope better with separation. Overall, subjective well-being measures, which reflect both material and non-material aspects of life, furnish additional insights and a well-rounded picture of the consequences of emigration on migrant family members staying behind relative to standard outcomes employed in the literature, such as the left-behind’s consumption, income, or labor market outcomes. Nikolova, Milena, Monica Roman & Klaus F. Zimmermann. Left Behind but Doing Good? Civic Engagement in Two Post-Socialist Countries. Journal of Comparative Economics, 45 (2017) 658–684. The authors document for two post-socialist states (Bulgaria & Romania) that migration can affect the values and norms of those left behind in the home country and promote more social behavior. See on this paper a recent Gallup Blog. And a related Linkedin blog. Juliane Scheffel (Leeds University, Business School, UK) and Yiwei Zhang (Beijing, China) find that internal Chinese migration has caused reduced happiness and a higher probability of loneliness among elderly parents. How does internal migration affect the emotional health of elderly parents left-behind? The ageing population resulting from the one-child policy and massive flows of internal migration in China pose major challenges to elderly care in rural areas where elderly support is based on a traditional inter-generational family support mechanism. We use data from the China Health and Retirement Longitudinal Study to examine how migration of an adult child affects the emotional health of elderly parents left-behind. We identify the effects using fixed effects and IV approaches which rely on different sources of variation. We find that migration reduces happiness by 6.6 percentage points and leads to a 3.3 percentage points higher probability of loneliness. CES-D scores of elderly parents are severely increased pushing average scores close to the cut-off indicating clinical levels of depressive symptoms. As emotional health is a key determinant of the overall health status, our findings have significant impacts on economic development in China.